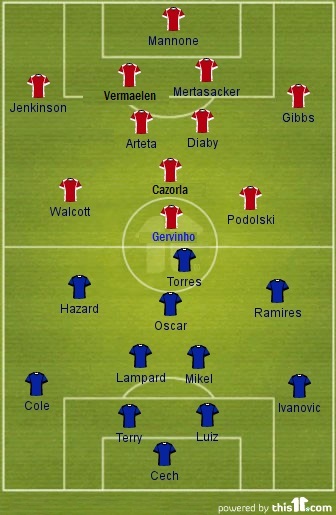 Arsenal v/s Chelsea Preview: Battle for London Supremacy! Both the clubs have changed a lot since last season. Both the clubs have seen their first choice strikers leave the club and both have seen heavy changes not only in the playing XI but in the back room staff as well. Seeing Robin Van Persie leave the club to join fellow rivals Manchester United and Alex Song join Barcelona, Wenger was criticized a lot for what looked like another poor transfer window. But that’s hardly the case now, with their 2 key signings Santi Cazorla and Lukas Podolski settling in brilliantly. Arsenal just like Chelsea go into this game with the league’s best defense and an unbeaten record in the league. The key move though in that Arsenal side will be the presence of new assistant manager Steve Bould who replaced Pat Rice at the start of the season. Bould has been praised recently for how he has managed to transform this Arsenal defense into one of the finest in the league so far. Chelsea on the other hand have seen Didier Drogba leave the club to join Chinese club Shanghai Shenhua. Chelsea’s record with Drogba against Arsenal is W7 D3 L1, without: W0 D9 L13. Drogba has been a key figure in encounters like these scoring 13 times in 11 games against Arsenal. Unlike the usual London derby, Wenger will know that this time around it will not be a case of “Beauty and the Beast”. Chelsea have spent big in this transfer window signing the likes of Hazard,Oscar who have made an instant impact in the league. So unlike last few seasons where he have traded strength and height against the Gunners this season will be a lot different, something Wenger is not used to. Arsene Wenger is expected to have captain Thomas Vermaellen back in the side after he recovered from a virus, goalkeeper Wojciech Szczesny (ankle) remains sidelined along with Czech winger Tomas Rosicky (hamstring) and defender Bacary Sagna (broken leg). Wenger was boosted by the news of the return of midfielders Frimpong and Wilshere although both will first sharpen their trade with the U-21′s on Monday. Chelsea on the other hand should welcome back John Terry and Frank Lampard who were rested last weekend against Stoke. John Terry was declared fit and available for selection while he decides whether to appeal the guilty verdict for his Football Association misconduct case. Daniel Sturridge is all set to miss this clash because of an hamstring injury. Lol I'm not a part of the 360 team. I doubt ChelseaFC name will change due to a change in stadiums. It's a worldwide recognized football club.